Time to show my “race“ card in time for the 2018 American mid-terms. Those of us who live in the “provinces” should have the opportunity to air our views, yes? Especially since we often hear the President erroneously referred to as the “Leader of the Free World”. This statement is just another manifestation of American Exceptionalism and general arrogance/ignorance on the part of many in the media and elsewhere. 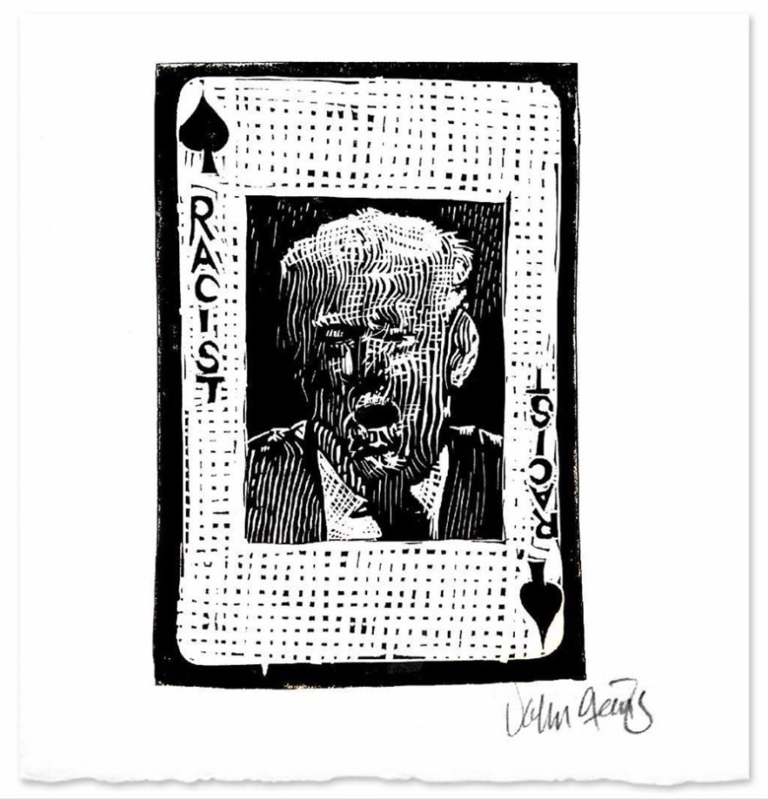 This design continues my ‘Axis of Weasels’ playing card series when the US invaded Iraq in 2003. At the time, I got kicked off eBay for selling my lino-cuts on their auction site. That caused a kerfuffle on the internet. But I did get my five minutes of internet fame! Yay! Seems like a narcissistic thing to say, haha! Especially when criticizing someone who actually suffers from this condition. Remember when his “bad hair day” vexed him more than the mass murder in Philadelphia? One of many sad examples. It boggles that one of the most powerful countries in the world – next to China – can elect a bumpkin like Donald Trump. Or does it? A textbook example of the Dunning-Kruger effect.